The recipe Radouga Distilleries uses to produce its acclaimed Provincial Vodka is a valuable trade secret. But Radouga National Marketing Director Cliﬀ Skene says the water from the interglacial aquifer beneath Radouga’s production facility at Blaine Lake, Saskatchewan is one ingredient he’s happy to talk up. “The easiest way to describe it is that a regular aquifer is like a lake in the ground while an interglacial aquifer is a lake that’s actually preserved in the glacial ice in the ground,” says Skene. There’s no question that many people are discovering that Provincial Vodka is a quality product. Enthusiasts include two panels of judges who awarded it a gold medal at The New York Wine and Spirits Competition in August last year. The blind taste tests pitted Radouga’s product against some of the biggest vodka producers in the world. “We were competing with very old, very established international brands with a lot of history behind them,” says Skene. “In his tasting notes, one of the judges wrote that Provincial Vodka is ‘uncompromisingly smooth.’” The vodka won a silver medal at the 2015 competition. Radouga also produces Provincial Spiced Vodka as well as Apple Pie and Blueberry Pie liqueurs. Company products are available at Saskatchewan Liquor and Gaming Authority (SLGA) locations as well as at independents, restaurants, bars and pubs. Participating liquor stores in Alberta now carry Radouga products, and the ﬁrm has applied to enter markets in British Columbia and Manitoba. Entering the U.S. market is one of Radouga’s big goals, and Skene says he expects to hear the result of its U.S. application very soon. 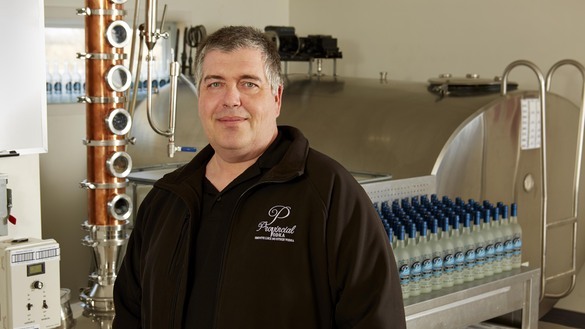 Radouga owner and CEO Paul Riben launched Radouga Distilleries in 2014 following years of market research. In spite of its short time in the marketplace, Radouga already requires a much bigger building to keep up with demand. When the company’s new facility is completed later this year, Radouga will be producing its smallbatch, boutique products in a 6,000-sq.-ft. building adjacent to its current property on Riben’s farmland, just outside of Blaine Lake. The new structure is about ﬁve times bigger than the one it will replace. Skene, who’s been with the company since 2015, says Radouga has eight full-time employees including its Saskatchewan sales staﬀ. The company has enlisted an agency to handle out-of-province sales. The larger bottles are a reﬂection of Provincial Vodka’s popularity and a more eﬃcient way to sell product. But success brings new issues. Skene says craft distillers in Saskatchewan can now produce up to 200,000 litres of product per year—up from the recent limit of 50,000 litres—and still retain their craft designation. One of the advantages of the designation is the right to sell product on-site; however, Radouga hasn’t included a tasting and sales facility in its expansion plans and hasn’t decided whether it will add one in the future. The question may soon become irrelevant as company growth may make it ineligible for site sales.